Porcine Epidemic Diarrhoea virus has been present in this country in a mild form for over 40 years. But new strains which have spread from China to the United States are wiping out whole generations of newly-born pigs, and there is no effective treatment. If the new acute strains of Porcine Epidemic Diarrhoea virus spread to Britain they could have an impact every bit as bad as PMWS (Postweaning Multisystemic Wasting Syndrome) which arrived in Britain from mainland Europe about 13 years ago and contributed to a halving of the national herd, only coming under control in recent years, here and around the world, following the introduction of highly effective vaccines. The current outbreak in the States, which is still spreading, is causing losses of up to 100 percent of affected piglets and has been reported on over 200 units in 13 states since May. The virus from the outbreak in the States is said to be 99.4 percent similar to an outbreak in China which has killed more than a million piglets since October 2010. "It is essential the new strains are kept out of Britain," the National Pig Association said. 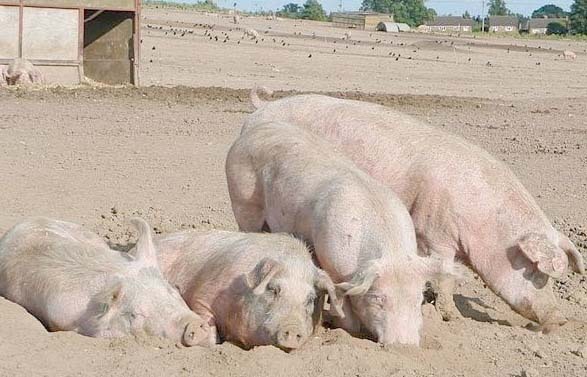 • Only absolutely essential visitors from overseas should be allowed onto pig farms and they must have entered Britain at least three days before the visit. Only unit clothing and footwear should be worn on the unit. • Similarly, if you are returning from overseas yourself, allow three days before considering yourself “pig-free”. In addition to its general advice to everyone in British agriculture, NPA advised all pig-keepers to contact their vet if they see unusual clinical problems with diarrhoea, particularly in piglets. "Producers should also work with their nutritionist, feed supplier and vet to check the provenance of nutritional products used on their farm, and consider whether any might pose an unacceptable risk." The association said that as a matter of principle no meat products should ever be allowed onto pig units, because of their potential to introduce serious diseases such as Foot and Mouth Disease, Classical Swine Fever, African Swine Fever, and perhaps the new virulent strains of Porcine Epidemic Diarrhoea. NPA is asking all pig-keepers — including hobby farmers — to run a critical eye over all their current biosecurity measures and see where they can be improved. And it is urging genetics companies to think carefully before importing live pigs from the States for the time being, regardless of the high level of biosecurity usually attached to such shipments.